The HeatUp project reached a major milestone this week: The prototype of a novel high temperature heat pump was installed in the SINTEF lab, which is designed to deliver thermal energy at 110°C – 120°C. 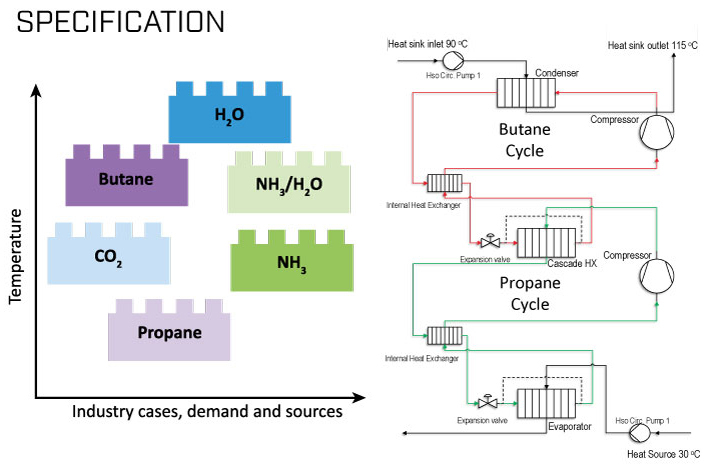 The heat pump cycle operates with the natural refrigerants propane and butane, which are characterized by the low global warming potential. 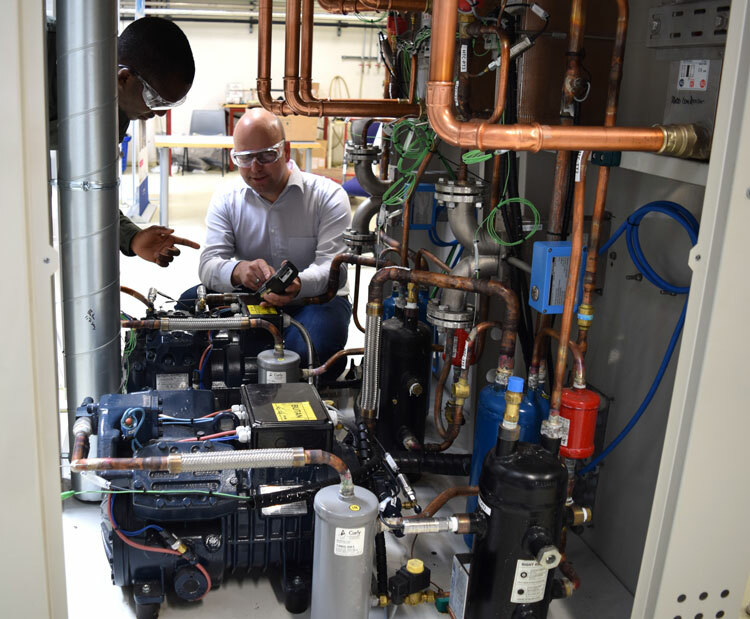 SINTEF Research Sdientist Michael Bantle and NTNU PhD student Opeyemi Bambigbetan are monitoring the first start up of the prototype compressors of the high temperature heat pump. The potential of this technology is clear: It shall replace fossil fuel based energy and enable the industry to process without the emission of climate gases. The installation uses water at a temperature of around 30°C as heat source. In many industrial applications excess heat is available at this moderate temperature level and it is estimated that several thousands GWh are wasted every year because of the lack of suitable heat pumps which enables to bring this energy back to temperature levels of 100°C or more, explains SINTEF Research Scientist Michael Bantle. It was the aim of the HeatUp project to demonstrate that such heat pumps can be developed, not only in simulations but also in the real life. The test rig is the result of 2 years of active research as well as industrial cooperation. The installation was built in cooperation with the CADIO AS, which is a local company in Trøndelag, and the compressor manufacturer Dorin Innovation from Italy. The heart of the system are the modified compressors, which are re-designed for continuous operation at this demanding temperature. Further work was dedicated to safety and environmental aspects so that the acceptance level in the industry is increased. The present installation can deliver up to 20 kW energy, but its design can be upscale with available technology to 200 kW. Opeyemi Bamigbetan, PhD student at NTNU, is especially thrilled that this heat pump is now under operation. He will in the coming year evaluate the performance, its efficiency and different operations of the system. The results will be a main part of his thesis.